After the death of Valens in the East in 378, Gratian appointed Theodosius as Ruler of the East. Theodosius was strongly supported by the Army and Gratian’s decision would have brought stability to the Empire. His keen interest in matters of faith brought him to call the Ecumenical Council of Constantinople in 381 and to adopt measures against both heretics and pagan cults. After Adrianople the Empire sought to deal with the relationship between Church and State and Theodosius took it to heart to promote the Nicene faith and uniformity of cult in his dominion. In 387 Valentinian and his court fled from Milan and sought the help of Theodosius against a possible invasion of Magnus Maximus. Various historians give different accounts of the encounter between the two Emperors; some see in Theodosius a paternal figure who welcomed his colleague and protected him from the usurper as well as bringing him to the true faith. This would undermine Ambrose’s impact on Valentinian which is better pictured in McLynn’s work about the bishop. However, Theodosius assumed control over the Army and defeated Maximus on the Alps in 388. The two Augusti ruled together for a while in a status of collegiate decision-making. Both Imperial Courts were to reside in Milan. This was where Ambrose and Theodosius met, probably for the first time. Valentinian kept his Imperial prerogatives but seemed somewhat eclipsed by his junior’s military and religious distinction. The first incident between Ambrose and the Eastern Emperor probably happened in the cathedral whilst the bishop was celebrating the Eucharist. Theodosius tried to sit in the sanctuary as this was a privilege of the Imperial family in the East, but Ambrose firmly rebuked him: ‘Purple can make Emperors, but not priests’. Years after, Nestorius denied a similar right to Empress Pulcheria in Constantinople, with a very different outcome. Yet, Theodosius was a Christian Emperor and thus bound to respect the directives of Ambrose in matters of faith. He did as he was told to. From this small but embarrassing incident it is easy to see how historians might have overestimated Ambrose’s power over Theodosius transforming their relationship into myth. Certainly the bishop had tremendous political acuteness and knew how to get the Emperor to do his Christian duties. However, Theodosius was a highly skilled politician as well; a testimony of this was his triumphal visit to Rome. It is difficult to quantify Ambrose’s influence on the two major incidents for which his relationship with the Emperor became famous. Theodosius was famous for impulsive reactions dictated by fits of anger; he often recanted his decisions once his mood cooled down. The Emperor – as well as Ambrose in his visit to Aquileia – received news of violence in the Mesopotamian town of Callinicum. A synagogue had been destroyed by Christians. Theodosius’ initial reaction was to punish the whole town for its anti-Semitic deed. Ambrose wrote immediately to the Sovereign urging him to amend his orders to the Comes. One of Ambrose’s epistles incorporates both letters he sent to Theodosius about the matter. The bishop’s views were uncompromising. After Theodosius repealed his order, he charged the bishop of Callinicum as accountable for the incendiary action and for the rebuilding of the synagogue with money from the Church’s plate. Ambrose on the other hand, demanded for the whole case to be dropped; scholars do however argue about the possibility of rhetorical exaggerations in his letter. In his view, the bishop could refuse to comply with the command and make himself either a martyr or – even worse – an apostate. Moreover the Jews would rejoice in their victory over Christ and write on the new synagogue: ‘The temple of impiety made by Christian hands’. Theodosius demonstrated how much power the Church hierarchy was gaining over the State by yielding to the bishop’s pressure. However, Liebeschutez points out how this letter could have been destined to the wider public as well as the Emperor. He urged Theodosius to distance himself from non-Christian religions as well as showing mercy to the people of Callinicum, reminding him of the generosity shown to Maximus’ family after the usurper’s defeat. The tragic events of Thessalonica in 390 sparked reactions from both Ambrose and Theodosius; reactions which would have been inconceivable in the Roman Empire just one or two generations earlier. Theodosius ordered a massacre of civilians after the murder of a Gothic general – and friend – Butheric in a riot. The reasons that sparked the revolt are not entirely clear but the Emperor’s reaction was unparalleled in recent Roman history. At least seven thousand people were slain by the garrison of the city, ‘mowed down like ears of corn in harvert-tide’. Ambrose wrote a letter to the Sovereign and its tones were of sorrow and friendship. The bishop never published this letter and this probably testifies to the delicate nature of the matter. 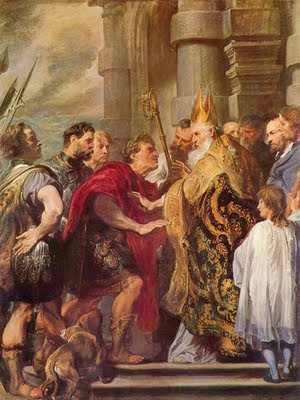 Ambrose offered a hand to Theodosius. Although the bishop declared him excommunicated for his violent acts, Ambrose invited his August ‘friend’ to do penance, repenting from his transgression: ‘Do not add another sin to your sin to cling to something which has proved injurious to many who have clung to it’ These words found fertile soil in Theodosius; he already repented about his violent judgement, but the new order reached Thessalonica too late. From a political point of view, the Court needed to avoid possible insurrections following the massacre, but this should not lead scholars to underestimate Theodosius piousness nor Ambrose’s influence over the Ruler. The Emperor took his place among the penitents in Ambrose’s basilica and asked for forgiveness. He humbling himself in the sight of the Church and left aside his Imperial robes. Theodoret dramatised the events in the basilica and after having been forgiven Theodosius said: ‘It is not easy to find a man capable of teaching me the truth. Ambrosius alone deserves the title of bishop’.